The Buni Yadi government high school in northeastern Nigeria sits on an abandoned plot of land. Birds have built nests in the neglected classrooms. Dusty breezes blow through burned-out window frames. Ashes pile up in the corners of the dorm rooms. In February 2014, just two months before the now-infamous abduction of schoolgirls from the town of Chibok, members of the armed terrorist group Boko Haram invaded the school in Yobe state. What happened at Buni Yadi was called a massacre. Fifty-nine students were murdered. Some were shot; others burned to death. Life is slowly returning to the campus. VOA met an engineer overseeing carpenters reinforcing collapsed ceiling tiles in one classroom. The government has ordered renovations to the school, but getting building contractors to work here is a challenge. "Contractors will not readily go to these areas. This, at the end of the day, will add to the cost of ensuring these projects are implemented in these areas because the risks are huge," said Alkasim Abdulkadir, communications chief for the Presidential Committee on the North East Initiative, which supervises the Safe Schools Initiative, or SSI. Thirty million dollars reportedly was raised for the initiative – started in 2014 with support from the United Nations Special Envoy for Global Education Gordon Brown – to help secure schools and coordinate humanitarian aid in the region where Boko Haram continues to operate. Frustrated by the ongoing attacks, activists are demanding to know how that money is being spent. Nigerian lawmakers have suggested a probe amid allegations of mismanagement. Students at Gamboru Primary School wait for more instructions from their teacher during a safety drill, May 2018. Even educators have been critical of the initiative, which is backed by private businesses and foreign governments, including Germany and Norway. "It is unfortunate [that], up until now, they have not done anything for us in terms of providing some security measures to be taken in our schools," said Mohammed Lamin, commissioner for Yobe's Ministry of Education. "Maybe they may come in the near future to start fencing some of the schools or providing some security equipment to us, but up until this moment, nothing has been done. It is only the state government that has been providing all these things to our schools." SSI officials told VOA that most of the money has been used to transfer more than 2,000 students to safer schools. That includes students from Buni Yadi, who now attend another school 160 kilometers from home. Attacking schools is at the heart of Boko Haram’s manifesto. Boko Haram literally means "Western education is sinful." The group largely ignores Islamic schools but has destroyed nearly 1,400 Western-styled ones, killing more than 2,000 teachers. Although the Chibok schoolgirls' abduction has garnered the most attention, Boko Haram actually has kidnapped more than 1,000 schoolchildren, according to the United Nations. ​Thousands of children are now being schooled at internally displaced camps managed by UNICEF. These IDP schools, established as another component of SSI, have also had to adjust to the ongoing violence, which is entering its 10th year. "The original idea of a temporary learning space was exactly that, temporary, with the expectation that after a couple of months, they would go back home. But now they’re staying," said Geoffrey Ijumba, head of the UNICEF office in Maiduguri, the capital of neighboring Borno state. Bamboo-roofed school structures are being converted into more permanent sites. The Buni Yadi school students have been transferred to another school in the city of Potiskum, located 160km away from Buni Yadi. Here, they say they feel safe to continue their studies. Photo by Chika Oduah May 2018. More than 2 million people have been forced to flee their home communities. Most have ended up in the city were Boko Haram was started: Maiduguri. Officials say the city is filled beyond capacity. UNICEF has directed $9 million toward SSI, using funds to renovate more than 200 classrooms and train thousands of teachers on security protocols. However, many educators remain fearful. At Zajiri Primary School in Maiduguri, principal Ishaku Hassan stands before students for the morning assembly. Alerting them to be on the lookout for suicide bombers who are known to quietly walk up to schools, he tells them, "If you see something, say something. Anyone who looks suspicious, tell your teacher." At least five teachers left Zajiri Primary School and headed to the southeastern part of Nigeria, beyond Boko Haram’s reach. 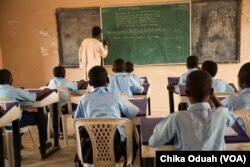 Hassan told VOA, "Boko Haram is still a threat to schools in Maiduguri. It’s a threat to teachers and even the community. Apart from the teachers, the parents don’t want to send their wards to school because of the situation on the ground and there is no mark for Boko Haram. You cannot trace if this person is Boko Haram." Educators are demanding more from the Safe Schools Initiative, though UNICEF is not positioned to fix all the security challenges. "Look, we cannot stop an invasion, an armed invasion of a school. This is not our mandate," Ijumba said. “We can train the teachers to provide psycho-social support. We can provide uniforms, we can provide school materials, we can provide water at the school, but protection of the school itself, it’s important that the security agents in the country, they take over that." The Nigerian army says it is conducting mop-up operations to rid the country of what it says is a severally weakened force. Nigerian President Muhammadu Buhari has said the Boko Haram is technically defeated. Yet, some towns are still under control of the insurgents. After Boko Haram fighters kidnapped more than 100 students from the town of Dapchi in February, more security personnel have been dispatched in the region. "Some are in plainclothes, but not all of them are actually at schools, but they have been dispatched to key locations around schools. We don’t have enough police officers to man every school. That is our challenge,” said the Borno State police commissioner, Damian Chukwu. Security lapses continue. Several Boko Haram attacks have happened this year alone. Trained by UNICEF, educators are teaching their students how to conduct safety drills. A high school student ducks in a classroom during a safety drill. Students in Maiduguri have begun participating in drills so they will know how to respond in the event of a Boko Haram attack. At the sound of a whistle, students abruptly leave their classrooms, hold hands and cover their heads while walking to a safe space. The training seems to be effective. "Very close to one school, there was an attack. Students, they heard the bomb blast and they practiced exactly what we taught them and thereby, quickly, all the students were in a safer place and they moved out," said Babagana Goni Ali. He works with the Borno State Universal Basic Education Board, which has been tasked with working with UNICEF to carry out SSI. He acknowledges that the SSI money could be managed much better. Educators have had to pay out of pocket for neighborhood vigilante members to guard school gates. Northeastern Nigeria's oldest elementary school, Yerwa Central Primary School, was established in 1915. Boko Haram insurgents have struck it at least three times, including in 2010, when they set 36 classrooms on fire, although a police station is next door to the school. Guards said they recognized the insurgents as current and former students. The principal and school secretary were among those killed. However, there still are no security guards posted at the front gate, and only two elderly volunteers watch the back gate to protect against attacks. At Gamboru Primary School, students duck and run down a staircase in a safety drill. Boko Haram once reigned in the community. Now, students are back in school, hoping the drills protect them.